Teens in Action is a high-energy, video-based program for ages 11-16. Developed over a period of five years and revamped in 2012, the program teaches important communication skills while helping teens understand the dangers of risky behavior, such as alcohol and drug abuse. Teens may act like they know it all, but they are full of questions and are eager to learn how to succeed in the adult world. 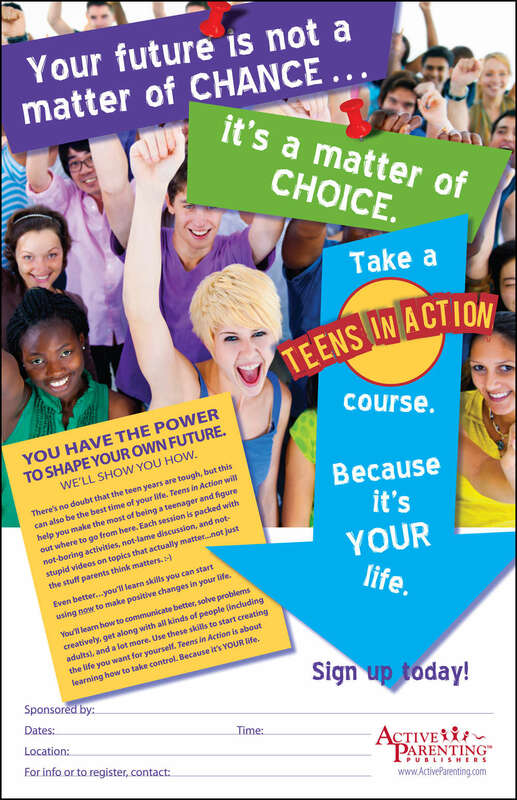 Teens in Action is a fun way to help them understand changes in their bodies and brains; communicate in a mature way with adults and others; develop skills for resisting negative peer pressure; and learn techniques for peaceful conflict resolution. This action-packed program is designed for use with kids ages 11-16—the crucial tween and early teen years. Your kit comes with many of the components necessary to upgrade by adding the research-based parenting teens class when you’re ready. Explore this easy-to-use new life skills program by clicking on the links at left.